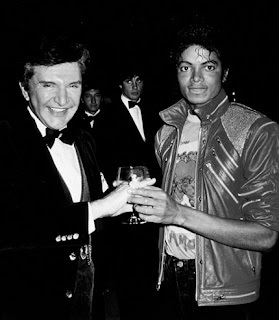 1983 - Liberace and Jackson attend a party at the Shubert Theater after the Dreamgirls opening, Los Angeles. 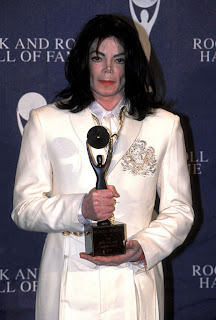 2001 - Michael Jackson’s induction as a solo artist into the Rock and Roll Hall of Fame, the Waldorf Astoria, New York City. 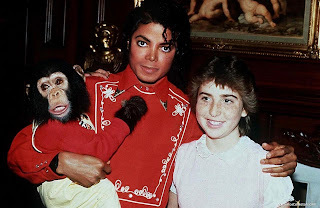 1986 - Michael Jackson poses with 14-year-old fan Donna Ashlock and his pet chimpanzee Bubbles at the Neverland Ranch in Santa Barbara County, California. Donna was recently the recipient of a heart transplant from high school friend Felipe Garza, who died of a brain haemorrhage. 1988 - Michael Jackson perform "The Way You Make Me Feel" & "Man In The Mirror" during the 30th Grammy Awards ceremony at New York's Radio City Music Hall. Michael, whose album "Thriller" won eight Grammy in 1984, saw his follow-up LP, "Bad," win only one this time around, for "Best Engineered Recording (Non-Classical)" while "The Way You Make Me Feel" wins the "Best Performance Music Video".